The titular location of Bad Times at the El Royale, the zippy new thriller starring Jeff Bridges, Jon Hamm, Cynthia Erivo and Dakota Johnson, seems too peculiar to be true: a glitzy novelty hotel packed with secrets (and, occasionally, a few mysterious guests) perfectly bisected by the California-Nevada border. But despite the many fictional mysteries depicted in the film, it's actually based on a real-life hotel — the Cal Neva Lodge & Casino on the shores of Lake Tahoe, once owned by Frank Sinatra, which itself has been host to a shocking amount of clandestine affairs, dubious legality and, of course, unsolved mysteries. Before you catch the Drew Goddard-directed film when it hits theatres across Canada on October 12, take a deep dive through the Cal Neva's shady history with Exclaim! 's four favourite unsolved mysteries from the infamous hotel. The history: The Cal Neva may be quite far from the Canadian border, but even Canadians aren't immune from the hotel's mysterious power. H. H. Betts, a former lieutenant-colonel in the Canadian army, traveled to Reno for a divorce but, on July 3, 1939, he disappeared from his room in the Cal Neva. The mystery: Over a year later, on September 11, human remains were found five miles away from the hotel, identifiable as Betts' thanks to a monogrammed wristwatch on the body and his Ontario driver's license found in the corpse's pockets. No suspect or cause of death was ever discovered, but the Ogden Standard-Examiner reported that Betts "was believed to be suffering from a lapse of memory at the time he disappeared." What happened to Betts after he was last seen in the hotel? Could the whole episode have been explained by divorce-related psychosis, or was there something — or, perhaps, someone — more sinister at play? The history: There were a lot of reasons to love the Roaring Twenties, but no one seemed to have more fun than actress Clara Bow. Initially one of the film industry's leading silent film stars, the actress successfully transitioned to talkies near the end of the decade, and would go down in history as the decade's biggest star — the term "It Girl" was coined to describe her. The mystery: On September 24, 1930, the actress had dinner at the Cal Neva with her future husband, actor Rex Bell, and another actor, Will Rogers. The trio ended up at the hotel casino, where Bow purchased what she believed to be $0.50 chips for a game of blackjack, leaving a series of blank cheques behind for the hotel to fill out to cover her losses. She ended up losing 149 chips. When the cheques later appeared for her at the bank, they were for the sum of $13,900 — the chips were actually worth $100 each. Was the star simply mistaken as to the value of the chips, or was this part of a larger conspiracy by the hotel to rob her of her wealth? The history: In May 1937, the Cal Neva mysteriously caught fire, causing over $200,000 in damages. The fire hit only a few weeks before its seasonal opening, while preparations were well underway. In fact, an automatic sprinkler system was in the process of being installed when the fire hit — local authorities hypothesized that had the system been completed, it would have put out the fire. The mystery: The Cal Neva was notorious at this time for circumventing many state laws — as gambling was illegal in California at the time, the casino was located solely on the Nevada side; additionally, patrons had been charged in violation of alcohol control laws for sitting on one side of the border and ordering a drink on the other. There would've been no shortage of reasons why members of federal or state law enforcement would want the establishment shut down. But could they have known that there was no completed sprinkler system, and might they have chosen the right moment to strike, knowing it could have been the last possible chance they would have before the system was fully installed? The history: The Cal Neva's glory days were during the Golden Age of Hollywood, so it's easy to imagine the property as a meeting place for the era's biggest and brightest personalities: future president John F. Kennedy was known to frequent the establishment, allegedly carrying out a series of extramarital affairs with wealthy divorcees, and Frank Sinatra was, for a time, the property's majority owner, using the resort to host lavish, star-studded parties. Marilyn Monroe was another frequent visitor, and the actress suffered a pill overdose at the hotel on July 28, 1962 — a week before her death. The mystery: Marilyn Monroe died at age 36 on August 5, 1952 at her home in Los Angeles of a barbiturates overdose, ruled a probable suicide. However, Monroe's hairdresser George Masters claims that he was with the actress at the Cal Neva the night before her death. In his audio memoir, Masters says that he and Monroe met with mafia boss Sam Giancana — a silent partner in the Cal Neva. There are dozens of conflicting theories about Monroe's final days, but it's clear that the Cal Neva (and the legion of shadowy figures surrounding it) were somehow involved. 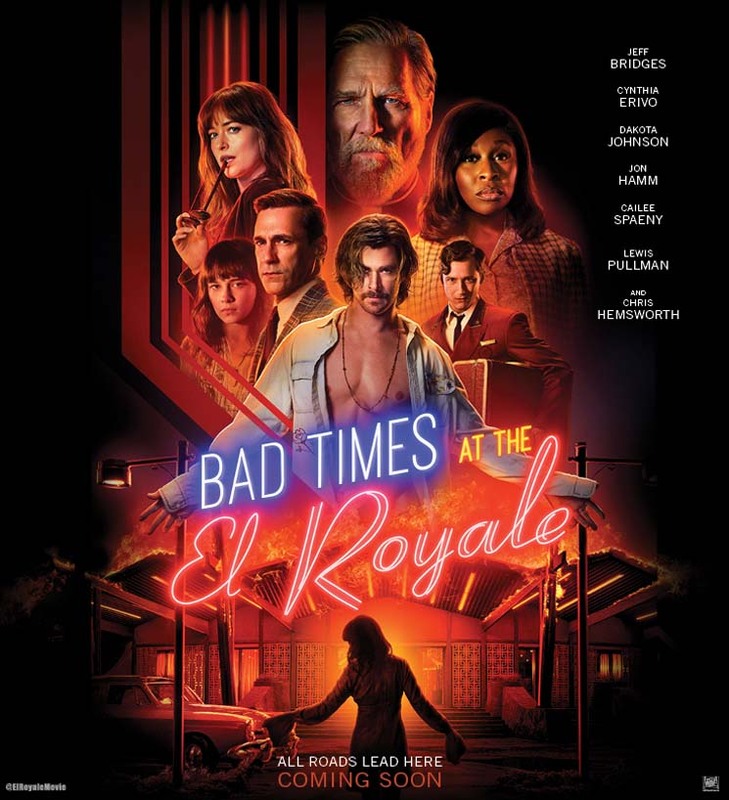 Catch 20th Century Fox's Bad Times at the El Royale in theatres October 12.